“This must be a real place,” Mark whispered. “But where is it? And how did I get here?” Whatever it was, the blue light was the key. Mark’s camping trip in the desert turns into chaos when he discovers a blue light. Snapping pictures, Mark moves closer and closer. A rattlesnake strikes out at his hand, and he jerks back. The sudden movement sends him toppling over and straight into the light. The air is thick and humid and smells of coming rain. Mark wakes up face down in the dirt, but he is not in the sandy desert anymore. He has been transported into a bizarre jungle full of mutant animals very much like the ones he knows on earth. Alone, in what Mark thinks is a different planet, he struggles to survive with the little supplies he possesses. One thing Mark knows is that the only way to get back to Earth is to find the blue light. As Mark is taking one of his scouting trips for the blue light, he finds an arrow stuck into a tree. It means that Mark is not alone in this strange place. There are other people, or aliens who can hunt and carve weapons. They may know of the blue light that can take Mark back to Earth. Mark finds the arrow people. They call Mark, 'Kakon.' Mark befriends a girl in the tribe called Leeta. One morning Mark wakes to see smoke hanging thickly over the small village. The meeting hut is in flames. The attackers are not simple village people. They are riding on beasts, carrying swords and shields. Those trying to fight are cut down immediately. Mark runs into the crowd calling to Leeta, but a rope is looped around his neck. The Tsook, the attackers, take with them what is left of the arrow people and Mark. Mark and Leeta are now slaves. In this cruel world of mutant animals and primitive tribes, Mark must make a new life, for he may never see home again. This book is full of adventure and suspense. 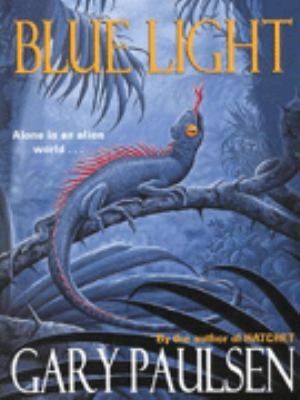 At first I wanted Mark to go back to Earth, but towards the end of the book, I was hoping that he would never find the blue light. 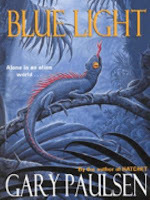 For those of you who enjoyed the Deltora Quest Series by Emily Rodda, you will probably enjoy Blue Light. Write your own book reviews!